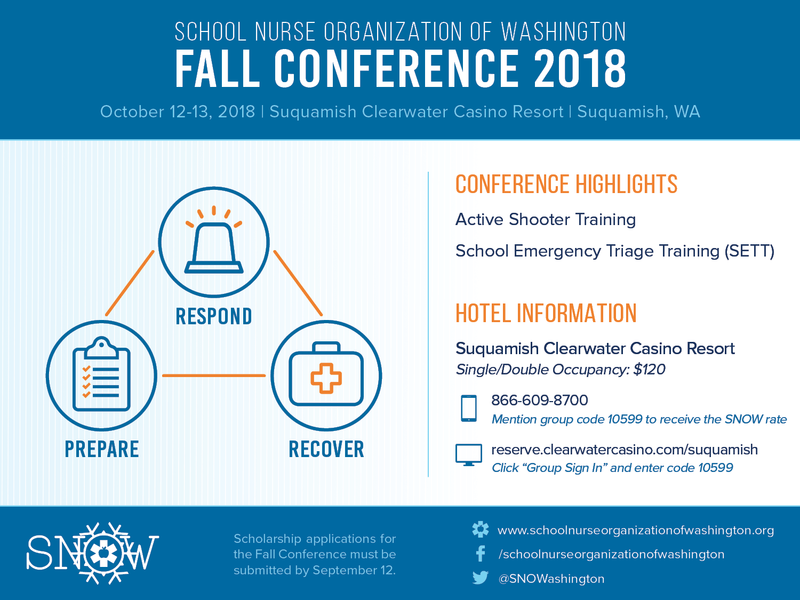 The School Nurse Organization of Washington (SNOW) believes professional growth is vital to professional excellence and demonstrates this by sponsoring conferences, classes, and interdisciplinary meetings. SNOW provides semi-annual conferences in the Fall and Spring each year. Responsibility to plan and organize conferences rotates among the ten SNOW areas. Have a topic that you think might be of interest to school nurses? Let your area representative know now! The School Nurse Organization of Washington awards two Gayle Thronson Lifetime Learner Scholarships (for $250.00 each) each year. One each for the Fall and Spring Conferences. These scholarships are available to SNOW members who are employed in schools. Applications are due by February 1st, 2019. Please see the column on the right hand side of the page to access the handouts in our library. You will need to be logged in to view the handouts. We will be posting handouts as they come. Are you interested in having a table at the conference? Please complete the Exhibitor Registration form. If you are interested in doing a poster presentation, visit the poster presentation web page for more information. Please consider sharing with your fellow school nurses! There is also prize money!